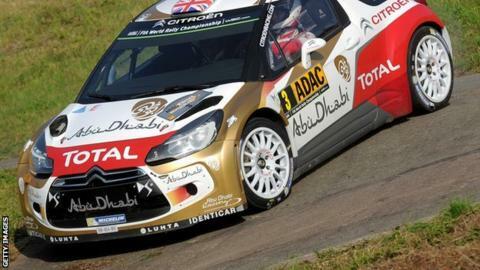 Kris Meeke suffered huge disappointment when he crashed out while leading the Rally of Germany on the final day. The Dungannon driver was second overnight but moved in front after Finland's Jari-Matti Latvala crashed and retired on the opening stage. Meeke was left with an 8.4 seconds lead over Thierry Neuville of Belgium, only for the Northern Ireland man to crash into a wall on the following stage. Neuville won the rally ahead of Dani Sordo and Andreas Mikkelsen. Meeke started the third day of the event 56.6 seconds behind leader Latvala. Latvala's misfortune set Meeke on course for his first win in the 2014 World Rally Championship. Meeke, who has three podiums in this year's series, crashed on the Grafschaft stage with the rear left wheel of his Citroen DS3 coming off.